Schulle – More water in all the usual locations. The creek has more inflow than it has had historically probably from increased impervious cover upstream and certainly from the weather pattern. 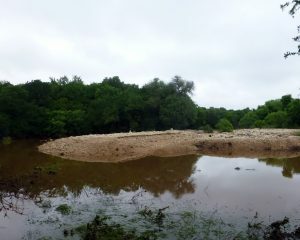 It has caused the visible erosion of the creek bottom to creep back up stream toward our armored crossing. The crossing is rock and will likely slow it down but it will be degraded at some point. Best solution is a bridge. The city could create a detention structure that might also provide a crossing but that is hypothetical at this point. Various bridge concepts have been considered but we have no plans or permission to construct a bridge at this point. 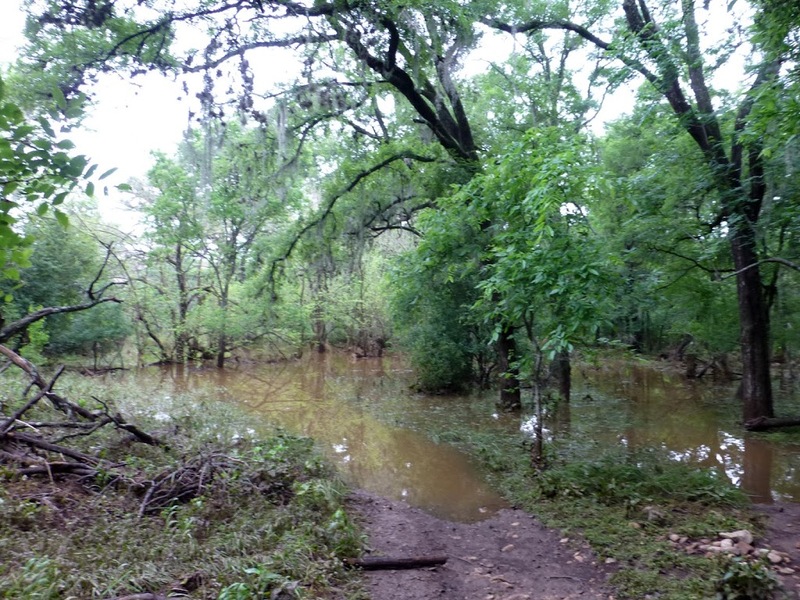 New trail reroute is under water in Lower Purgatory. The big washout on the gravel trail, Witte Way, between the entrance and the loop just gets worse. The parks department has plans to build a boardwalk. Other locations on that trail, mostly in the looped section, will require a variety of treatments that SMGA could address. The solutions will require some materials best supplied by the city. Other natural trails seem to be holding up though it is time to make some minor improvements. Kenneth knows the park well and reported conditions as well as getting in to trim the trails and tweak here and there. Ringtail – The gravel trail has two major issues: 1) the bridge on the east side of the park which has its abutment points badly eroded such that one has to step up to use the bridge, 2) the section of the gravel trail between the aforementioned bridge and the back side of the ponds gets repeated scouring with every heavy pulse of rain. The repair of the bridge will take some heavy work to guarantee the attachment of the structure and the stability of the two approaches. The trail section will also require major reconstruction. 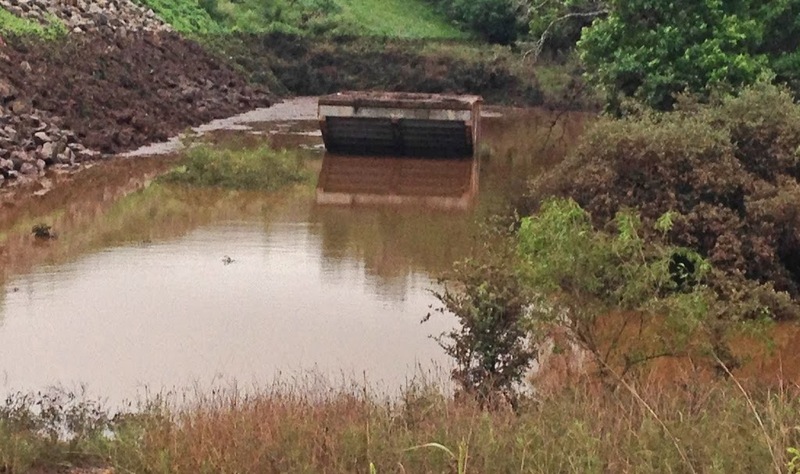 The parks department received a promise of funds to make repairs from FEMA. Whether that money makes it into their control and whether or not the money is actually spent on those projects is not certain. The good news is that the rainwater system is functioning well though it is not filling as fast as we would hope. Our other trails are working well after a trail crew maintenance blitz April 6th. Ringtail is sometimes overlooked by those seeking a pleasant, accessible, varied nature hike. It’s always worth the visit. Al worked there after the flood and reported conditions and addressed some of the larger dead or leaning trees throughout the park. 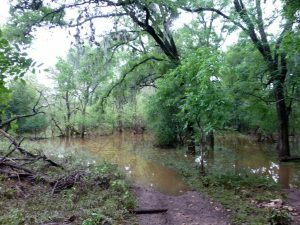 Spring Lake natural area – Oye! 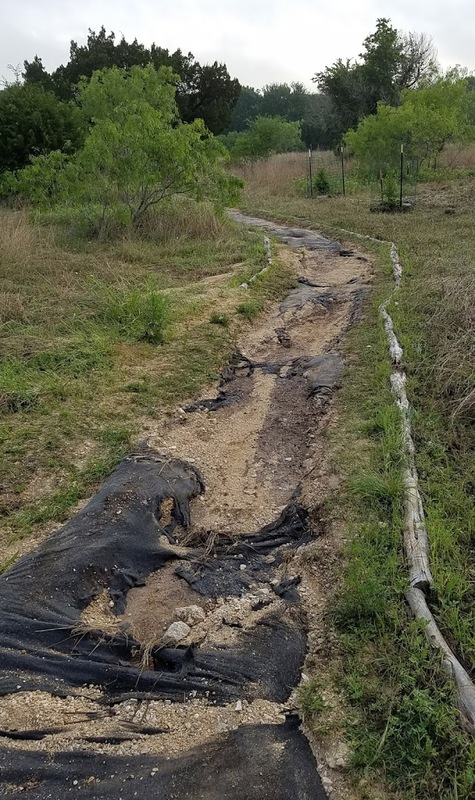 I scouted the day before the big rain and noticed erosion in the gravel trail, Tonkawa, near the upper portions before it turns toward the hilltop. This area was seriously damaged in 2015 and the city restored it to the original state. I have not seen it since the rain we had on Tuesday but I understand the rain rates were not as bad toward that end of town so perhaps the continued erosion was not too serious. On the Lime Kiln side of the hill all the trails have issues. These trails are older, badly planned jeep tracks that all need rerouting which was my mission for scouting on Monday. It will take some time to do. In the meantime the mud pit on Buckeye where it meets Exogyra near the pond continues to generate lots of complaints and muddy shoes. Even with an alternative trail I’m not sure this segment can be closed due to its proximity to the pond and the intersection with other trails. We may have to get serious about a fix. I walked in on Roadrunner from Elm Hill Court to the overlook today and it looks great. The permeable plastic pavers work well at holding tread and what little loss in gravel there is would easily be replaced and tweaks made to reduce reoccurrence tough not really necessary. The rock sitting nook that Joel and Mary and others helped create is getting use. Across the valley of the LCRA easement a large crane can be seen expanding the substation on Ramsey St.
Purgatory Creek natural area – Lower Purgatory between Hunter Road and the dam and overpass was, of course severely impacted by the heavy rains. on Wednesday afternoon. Trail crew is pestering the parks operations manager to move some of the gravel wash from the spillway to the new Dante to serve as a trail crossing. Gravel bar from Halloween flood is underwater again. Lance, then Joel and I checked out this area. 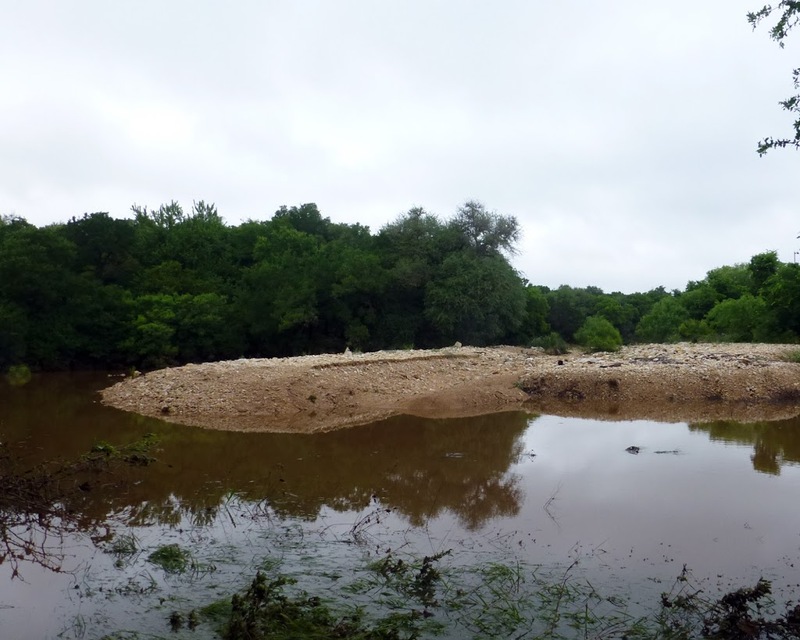 Joel went on to inspect the creek bottom, the inundation area behind the dam. Beatrice was swamped since the water level was just slightly below the T-head drain. It was clear that a great deal of the flotsam we saw in 2015 has come back to cover the lower elevation segments of Ovid and Beatrice and Dante. [long sigh] We’ll have to wait and see. We may have to repeat some of the tasks we had to address after the 2015 flood. Maybe it’s time for some strategic trail contemplation. Not sure what there is to report from Malacoda. Prospect had some serious erosion on Virgil mostly in the bottom meadow area. The switchbacks near the entrance we reconstructed a few years ago held up well though it may need some prevention attention by next year. Thursday, April 13 – Normally when conditions are this wet we don’t work but we had a number of odd tasks to attend to in Prospect and in the workshop including the taping and sharpening the tools, rehandling a Pulaski (very well done by Scott and Joel) and the control of a beehive right next to Limbo Loop trail by Gordon, a newer member who many of you may not know. He said it was amazing that the hive hadn’t attacked anyone. We did a little experiment on a big Ligustrum, took out some elbow bush, pruned along Virgil, cleared out more dead wood and more. We also seeded areas that were washed to the ground in an effort to add more diversity and pollinators to the natural area. Meanwhile Kenneth worked in Schulle. Sheesh! They’re a mighty productive group to say the least.